Experience the timey-wimey travels of the Doctor moment by moment with this historical Doctor Who coloring book. Inside you'll find the Doctor's greatest friends and foes from throughout all of history, with original illustrations featuring Churchill, Shakespeare, Van Gogh, Dickens, Madame de Pompadour and many more. Color in kings and queens, Romans and Egyptians, Viking villages and erupting volcanoes . . . not forgetting the occasional dinosaur on a spaceship. With 45 brand new images to color, Travels in Time is a fantastic addition to any coloring collection. 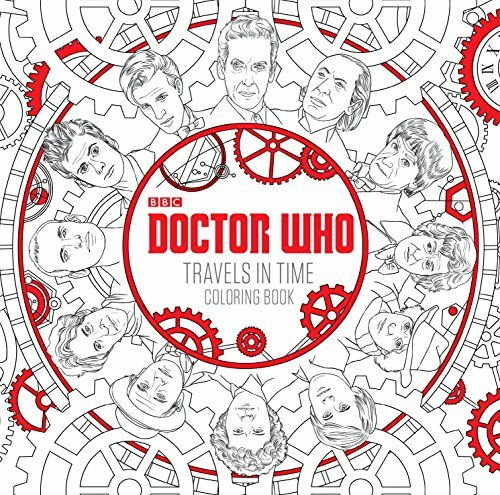 Illuminate all of human history in this Doctor Who Travels in Time Coloring Book! Fly through the centuries with 96 pages of original artwork from the hit BBC series. Romans and Vikings, Queens and Emperors, Shakespeare, Churchill, van Gogh and Vesuvius, plus the occasional dinosaur on a spaceship, all illustrated inside this beautifully detailed coloring book. Includes pictures to color, plus fantastic quotes from the world of Doctor Who . The Doctor Who Travels in Time Coloring Book measures about 9 9/10-inches tall x 9 9/10-inches wide. If you have any questions about this product by Penguin Random House, contact us by completing and submitting the form below. If you are looking for a specif part number, please include it with your message.